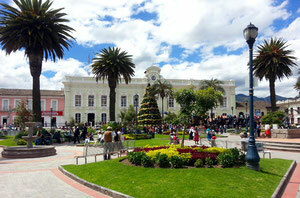 Otavalo has about 40,000 inhabitants and is located in the province of Imbabura. The town is located 2,550 meters above the sea level and its climate is very pleasant. Throughout the whole year the climate is mild with 15-25 °C during the day and not too much rain. The city is 95 km north of Quito and 20 km south of the provincial capital of Ibarra. The main attraction of Otavalo is the famous indiginous handicraft market. It is considered to be one of the largest indigenous markets in South America. Around Otavalo there are many indigenous communities that are famous for producing textiles and handicrafts. The inhabitants are known to uphold their music, clothing, customs and traditional values. The beautiful scenery around Otavalo offers a lot. For more informations see "Activities around Otavalo"
Quito is the capital of Ecuador and the highest capital city in the world (it lies even higher than Sucre in Bolivia). It is located 20 km south of the equator line at an altitude of 2,850 meters above sea level and has about 2.2 million inhabitants. 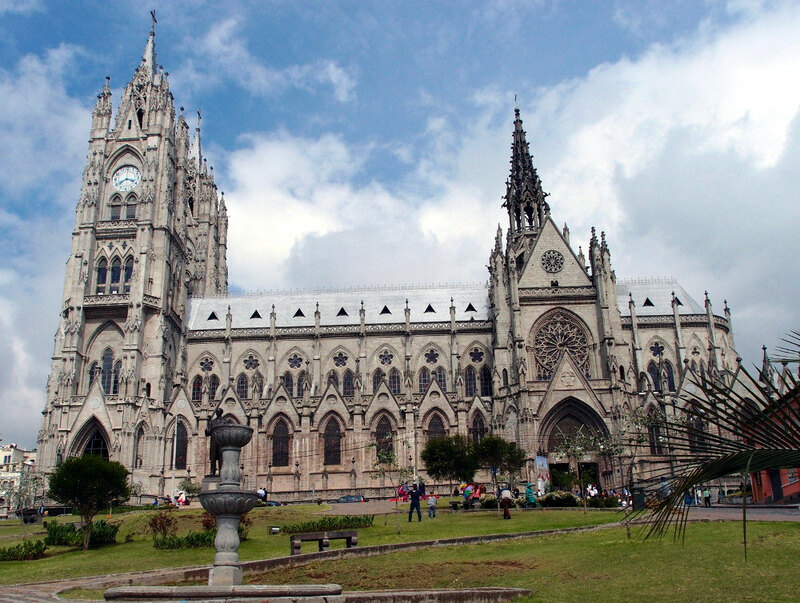 Quito is surrounded by 14 volcanoes and it is the second largest city of the country, after Guayaquil. The old town of Quito is a UNESCO World Heritage Site. There are the Presidential Palace, the Cathedral and the Basilica and a lot of churches, convents and secular buildings to visit. North of the center lies the newtown ("Mariscal Sucre"), including the financial center, government buildings, shopping centers, the National Museum of the Ecuadorian Central Bank and numerous restaurants, also with international cuisine. West of the city lies the 4.100 meters high Pichincha volcano, the nearby mountain of Quito. It can be reached in a cable car. From there the view over the city and the mountain panorama is stunning. 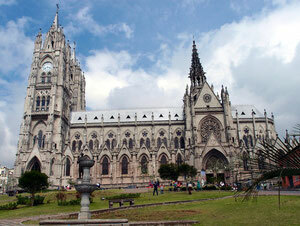 In 2013, Quito was honored at the International World Travel Awards as the best destination in South America. In an interview the second President of the World Travel Awards, Chris Frost, said that Quito received votes from 171 countries. This is a record that has been unequalled by any other city. The Director of the World Travel Awards, Sion Rapson, praised the city in his speech as a UNESCO World Heritage Site with an impressive pre-columbian and colonial history. In particular, the historic old town remained in their origins preserved and with its numerous important buildings and monuments unique in the world. Quito is at 2,800 meters, the highest capital in the world, 20 kilometers south of the equator and for this also called “center of the world". Ecuador is located in the northwest of South America, between Colombia and Peru. The country has approx. 15 million inhabitants, the capital Quito is located in the Andean highlands. However, the largest city is located on the Pacific coast and is called Guayaquil. It is the economic center of the country. The equator line runs through Ecuador and was eponymous for the country. Renowned for their unique wildlife Galapagos Islands are located about 1,000 km west of the mainland in the Pacific Ocean. 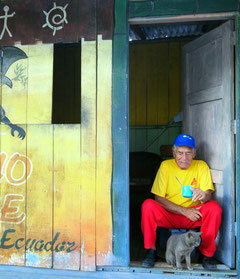 The official language of Ecuador is Spanish, the most spoken indigenous language is called Kichwa. Since the great inflation at the beginning of the year 2000 Ecuador took the U.S. dollar as its official currency. The climate of Ecuador is very pleasant. The prestigious magazine "International Living" elected in its Global Retirement Index Ecuador as the country with the best climate in the world. "The best weather in Ecuador can be found in the Andean cities such as Cuenca, Otavalo, Quito and Vilcabamba" says Dan Prescher (Internationalliving.com special projects editor). In Ecuador, there are 55 volcanoes, of which 18 are classified as active. The highest volcano is the Chimborazo with 6.310 meters, followed by the Cotopaxi (5.897 m) and the Cayambe (5.790 m) volcanoes. Nevertheless, earthquakes are less frequent and less heavy than, for example, in Chile. As Ecuador is not a very large country (slightly larger than Great Britain) and has many animal species, it is considered as the richest animal country in the world. It has a rain forest on the Pacific coast, the Amazon, the Andes and the Galapagos Islands. In Ecuador, for example, live three different Tapir species, condors, pumas, spectacled bears, coatis, ocelots, deer, jaguars, freshwater dolphins, armadillos, howler monkeys, spider monkeys, giant tortoises, iguanas, galapagos penguins, flamingos and many other interesting species. From a tourist’s perspective, Ecuador is a very interesting country. Mainly, because of the rich fauna above, but also the flora is extremely diverse. Ecuador offers an incredible variety of landscapes, the Galapagos Islands, the Avenue of the Volcanoes, the tropical mountain forest on the eastern slope of the Andes, the Amazon basin, and much more. Quito has the best preserved colonial city in South America and was accepted as the first city ever as UNESCO World Heritage Site in 1978. Ecuador is definitely worth visiting.